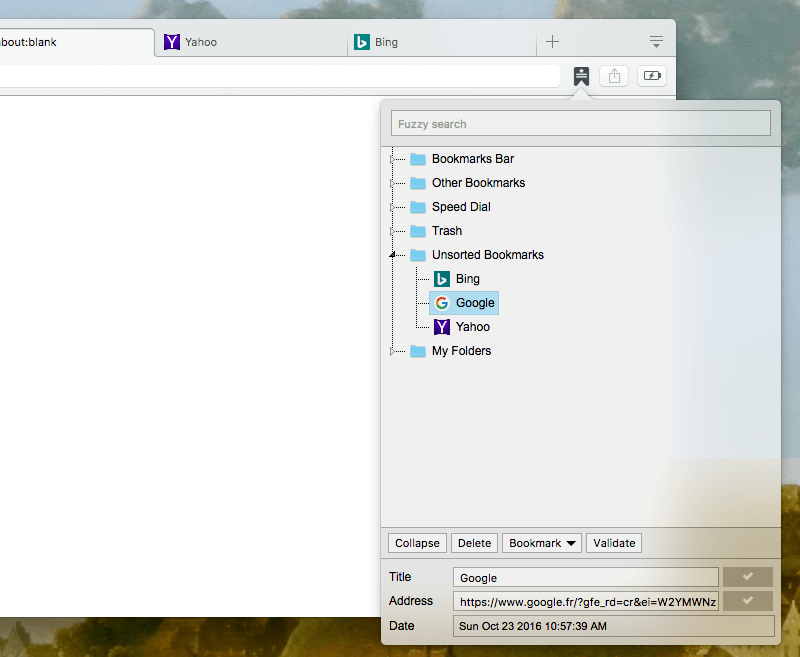 "Bookmarks Manager and Viewer" enables you to view and modify bookmarks from a toolbar panel. The extension provides easy to use panel view for all your bookmarks, also you can fuzzy search (like Google search) through all your bookmarks to easily find matching items. This extension supports full editing of bookmarks with drag & drop support. What is the "Bookmarks Manager and Viewer" add-on and how can I use it? "Bookmarks Manager and Viewer" extension aims to provide a convinient solution to manager or edit bookmarks. Using this extension you can view all your bookmarks, search through them, or even edit them on the fly. The extension displays a toolbar button. Pressing the button, loads the panel view where all your stored bookmarks are listed. The extension has session manager which means, the panel will remember the last seen item and its location for easier access across browser restarts. What is the "properties" section of the panel and how can I use it? Properties section is a live editor for your bookmarks. When an item is clicked, its info is displayed in this section. Title and URL is editable. Simply modify these values and press Enter key for that changes to take place. What is the "toolbar" section of the panel and how can I use it? The toolbar section can be used to create a new bookmark from current tab, or from scratch. It is also possible to create a new directory and then drag and drop bookmarks into this newly created directory. You can also delete a bookmark or an empty directory using associated buttons. Note that deleting a directory that contains child nodes is not possible for your safety as this operation is irreversible. In this section there is a "Collapse" button that can be used to close all the opened nodes. It is useful when you have too many bookmarks and have already opened a few directories and the panel looks cluttered. What is the "search" section of the panel and how can I use it? Search input box is equipped with fuzzy searching. When an inquiry is entered in the search box, the extension will try to weight each bookmark relative to the entered phrase. The most matched items are displayed sorted by their weights. Clicking on each item, will resolve its position in the tree view. When you are done with the search results, either double click on a result or clear the search box for the result section to disappear. Search engine uses title and URL of each bookmark for finding the most matched items. Why does the color of the toolbar button change on some websites? If current tab is already been bookmarked, the color will be blue otherwise the color should be dark gray. To find the location of the bookmark, you can you the search field. Enter the URL in the field. How can I open a bookmark in the current tab or in a background tab? Can I validate single or multiple bookmarks with this extension? Yes, as of version 0.2.0, to validate a bookmark or a set of bookmarks, first select all of them (use Ctrl-key to select multiple bookmarks; use Shift-key to select all bookmarks from the selection start point). Then right-click and choose the "Validate bookmarks" item. The search panel opens up and there is a validate button on the top-right side of the panel. Press this button and wait until all the bookmarks are validated. The extension performs 3 validation at once (the timeout for each validation is 10 seconds). Those that pass the validation will be marked as green color and those that cannot pass validation will be marked as red color. Note that if a folder is selected for validation, all its child bookmarks will be validated. So to validate a folder, just select a single folder not multiple folders at once. Validation can be performed on any search results too. Basically, when the search panel is opened, all its bookmarks can be validated. Can I delete multiple items at once? Yes, as of version 0.2.0 it is possible to delete all the selected items at once. Can I duplicate one or more bookmarks using this extension? Yes, during the drag operation, use the Ctrl key (or Command key in Mac OS) to duplicate all the selected items. If a folder is getting duplicated, all its bookmark tree also get duplicated. Can I use this extension to view the content of RSS feeds (live bookmarks)? If a URL contains "rss" or "feed" keyword in its URL, this extension considers it as a dynamic folder. When this folder is clicked, the extension loads the remote XML content and displays each entry as a non-draggable bookmark item. You can use this feature to check RSS feeds without the need to install an additional extension. Note that when a new bookmark with "rss" or "feed" keyword in the URL is inserted, you will need to reopen the popup for the extension to parse the remote content. Note: you can ask the extension to focus the search box on open from the options page if you use this feature frequently. When you are on the search box, to move to the search results press the “Enter” key once, then use the up and down arrow keys to move to the next or previous search result (you can use your mouse pointer as well). If you would like to hide the search result, press the “Enter” key which moves the focus back to the bookmark tree and hides the search results. You can press the Ctrl + F anytime to move back to the search box. Can I validate or search within a folder? Select the node that you would like to limit your search results to and use the right-click context menu to select the "Validate Bookmarks" item. This action will insert the "root:id" query in the search box. You can refine this search by appending your own query. If you need to validate the result, press the "Validate" button afterward. I have too many bookmarks and it is really hard to find the one that I am looking for. Any idea how to easily locate it? This extension has two searching methods. The default one uses the internal bookmark APIs to perform the search and find matches. The second one is the fuzzy search which is useful when you are not a hundred percent sure about the spelling. Note that the fuzzy one is slow and takes some time to build the indexing. If you have a large set of bookmarks, it is recommended to take a look at "Advanced Bookmark Search" extension by Lunu. It is designed to search large databases very fast. It can be a good addition to your existing bookmark add-ons.